What makes a perfect weekend? What are the essential elements that must come together to create a weekend of ‘Kismet’? Well, this past Labor Day long weekend we discovered that the perfect weekend can be as much about what is omitted as what is included. The night before our departure I suffered a night of insomnia. They come up from time to time, and usually at inopportune moments like this one. I awoke to a rainy morning, an achy neck, a recurrence of a niggling sore throat I have been fighting for weeks, and a bad mood. Ben was a trooper. I was a trooper. We managed our morning like seasoned travelers and were showered, fed and packed without too many snippy words. We loaded the car in the rain, and made the early ferry (7:55am) with several minutes to spare. We would ferry from Seattle to Bainbridge Island, then drive across the island and over a bridge onto the Olympic Peninsula. I wanted either coffee or sleep. I opted for sleep and soon discovered that the fully reclined passenger seat of Ben’s car combined with my awesome pillow (which I take with me everywhere) is the PERFECT way to travel long distances. I was out like a light. 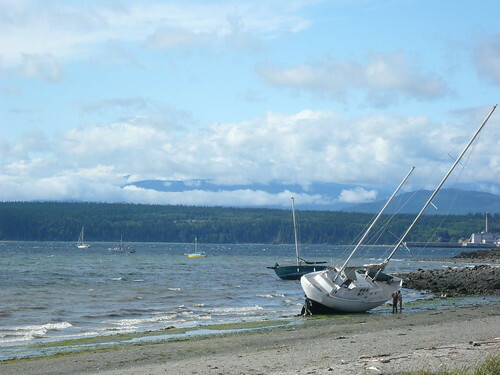 When I emerged from my coma, we were in Port Townsend, a pretty town on the north-eastern tip of the peninsula. My friend, Todd, had tipped us off that it is was a great spot, so we detoured off course to fit it in. The weather in Port Townsend was what my dad would call ‘wild and woolly’. [It is an expression I have grown up with, so I know that it means ‘really windy and a lot wet’, but now that I have written it into this post, I am wondering how the ‘woolly’ part comes into play.] It had stranded these two boats on the shoreline, and when we got out of the car, it threatened to blow us out straight back of town. We opted for a safe haven in the form of the nearest coffee shop, where we drank tea, and ate American-style scones. Ben asked for soy milk, but we were informed that they didn’t use soy milk, because it is VERY bad for you. Sure. Okay. Whatever you say. After tea Ben suggested we walk through the town a bit. For me the day was only just coming in to focus, so I said yes, despite the weather. I needed to wake up fully. We discovered some gorgeous architecture that has been lovingly restored, and many galleries. I bought a few little trinkets – gifts mostly – including a giant sand dollar from the curio shop. It now sits with our African Goddess and our Indian Elephant – three continents represented in one corner of our living room. The people we met were lovely and chatty, and I know this is a place I would like to go back to sometime soon. Moving on from the windy town, we made our way south and then west towards Port Angeles. We would be staying at a B&B there later in the day, but it wasn’t even lunch time yet, so we pressed on towards the Sol Duc Hot Springs. Lunch was an impromptu stop at Granny’s Cafe, an old school diner on the main highway. I believe it is solely for this reason that people stop there to eat, and has nothing to do with Granny, the food, or the collections of ‘things’ that fill every horizontal surface. The food was, at best, passable. Fed, we hopped back in the car, still on course for Sol Duc Springs, and took a detour to Lake Crescent, where we saw our first glimpse of sun that day. The Lake is in the Olympic National Park, but holiday homes pepper its shore. From one angle I could have sworn I saw how it must be at the height of summer, even though the true temperature was closer to 58F (15C). As we left, the rain came again. After winding around the south side of the lake – a beautiful drive – we turned off the highway and into the central part of the national forest. We overshot the hot springs and drove instead to a trail head for, among other destinations, Sol Duc Falls. It was only sprinkling lightly, but had clearly rained heavily at some point, because the trails were dense with mud. Just as I pointed out a beetle for Ben to avoid stepping on, there was a sharp pain in my hand. I quickly pulled off my glove, thinking that maybe a spider had nestled in there over the summer, but no. A yellow jacket hornet had stung me through my glove and it hurt like hell. A quick detour back to the car to dress my wound, and we retraced our steps back towards the falls. We were rewarded for our efforts – and my pain – with this spectacular sight. We made our way back to the car while I watched carefully for attack hornets. Back at the car we met a lovely group of middle aged people who had been stranded by a dead car battery. Fortuitously for them we happened to be parked right next to them, and could give them a jump start. “Thank goodness,” said one of the women. “We were so worried that the people on either side of us were off trekking for days on end.” She had no way of knowing that trekking for days in the rain is my closest idea to hell, but we all agreed that our car’s proximity to theirs was ‘great luck indeed’. Sometimes you meet the nicest people. Feeling good about our small act of kindness, we drove a short distance, grabbed our swimsuits and paid admission to the Sol Duc Springs Resort. I kind of knew when I saw first the ‘hot springs’ – essentially giant hot tubs stuffed with tourists and their splashing children – and then the filthy change rooms, that it would be a short visit. I was disappointed for many reasons. Mostly, I had looked forward to the hot springs because my neck, shoulders and upper back had been chronically sore for days. It was becoming hard to sit, sleep, stand and move – which pretty much didn’t leave much time when it didn’t hurt. I had also been to the hot springs in Aguas Calientes, Peru, which were beautiful, exceptionally clean, and set into the side of a mountain, so my expectations for the Sol Duc Springs were high. The stench of sulfur did nothing to ease my aches, and I wished it was a better experience all around – especially for Ben, who was experiencing a hot springs for the first time. I stayed in as long as I could, but when I saw the 30th strand of hair float by, and then a band-aid, I got out, quickly showered and dressed. Ben was not too far behind me. Before leaving I filled in a comment card, and as this post goes to press, I received a lovely email from the management apologizing for the state of the facilities and offering a free pass for us both on our next visit. Hmm. Thanks, but we’ll think about it. It was time to head to our accommodation for the night and I looked forward to getting clean and dry and out of the outdoors. Sometimes, Adventure Chick. Sometimes, Princess. Princess was ready for a bath! We fully intend to return, so will certainly look that up – thank you! I am sure there is much else we missed, too, but for a ‘taster’ we are pleased we got to see as much as we did. What a lovely place, those falls. I’m sure it would make a beautiful painting. You’ll have to share more photos. I have some painting to do and not a lot of time to do it in. Thanks for the inspiration.